f you were asked to name a few types of cancers, would ‘kidney cancer’ come to mind? Most people know something about their kidneys, such as their bean-like shape, their approximate location in the abdomen and maybe something about their waste-extracting function. However, there is a lot of information about kidney cancer that you may not know. 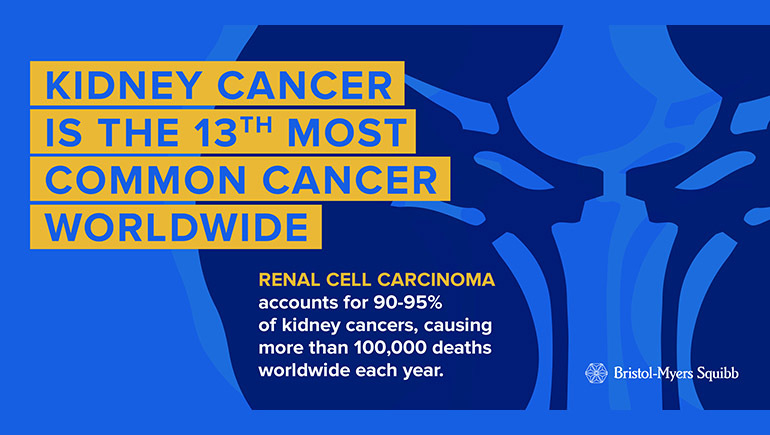 Bristol-Myers Squibb is helping to raise awareness of this serious disease and the first World Kidney Cancer Day on June 22, hosted by the International Kidney Cancer Collaboration (IKCC). Kidney cancer is the 13th most common cancer in the world and the incidence is expected to increase 22 percent by 2020. In the U.S., almost 64,000 people will be diagnosed with kidney cancer and an estimated 14,400 people will die from the disease in 2017 alone. The most common type of kidney cancer is Renal Cell Carcinoma, or RCC, and it accounts for 100,000 deaths worldwide each year . Did you know there are some risk factors that may make it more likely for someone to develop kidney cancer? For example, smoking, obesity, high blood pressure, family history of renal cancer, some inherited genetic conditions, asbestos exposure and even being male have been linked to a higher risk of having kidney cancer. Another lesser known fact about kidney cancer is while some cases may be identified early, not all cases are easily detected. Sometimes, kidney cancer might be found accidently while testing for other diseases. It may go unnoticed as it doesn’t often cause any pain. The kidneys are also located deep inside the body, so it is more difficult to see or feel the tumors during a physical exam. While imaging tests, such as ultrasounds, can find small tumors, usually kidney cancer screenings are only recommended in people who are at increased risk. As a result, some people are not diagnosed with kidney cancer until the cancer is more advanced. At Bristol-Myers Squibb, we are committed to helping patients get the information they need about kidney cancer and qualified resources for their conditions. We’re also focused on research and advocacy programs, not only to develop treatments to address unmet medical needs, but also to expand awareness of disease prevention, cancer screening and treatment options. Join us supporting the first World Kidney Cancer Day by testing your kidney cancer knowledge and help us educate others about this lesser known cancer.